You've finally made it; college life! This is a very exciting time. The next 4/5 years will define who you will be as a person for the rest of your life. In so many ways your university years influence your personality, from the classes you take to the friends you make, from the nightlife to your Jewish experience. "Jewish experience?" you ask, "that wasn't on my to-do list at Chapman". Well then, welcome to Chabad at Chapman. You're soon to find out that doing Jewish at Chapman is the next big thing on the block. For starters, being part of the coolest community on campus gives you a warm "home away from home" and a sense of "fraternity", excuse the pun. If done right, it will enlighten you and answer some of the most pressing questions you'll have during this new phase in your life. Celebrating Shabbat at Chapman is one of the greatest experiences you can have. Friday night begins with a lively service, followed by a delicious four course home-made dinner! 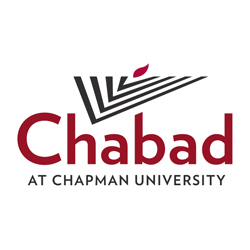 Where: Chabad at Chapman University 638 E Collins Ave Orange CA. Enjoy a delicious Kosher BBQ, while you check out all that Chabad has to offer, and become part of the family! Even if you are no longer a first-year student, invite your friends and join us as we welcome a new class of Jewish Panthers!